There is no right way to celebrate (or not celebrate) a cancerversary. Eli, the author's bone marrow transplant donor, with Watson in a recent photo. I was diagnosed with secondary Myelodysplastic syndrome in April 2001, after having gone through chemo for Ewing’s sarcoma the previous year. On Aug. 24, 2001, 15 years ago this week, I had an unrelated (allogeneic) bone marrow transplant. On the day of the transplant, I lay in a hospital bed, surrounded by friends and family, listening to Sarah McLachlan on the CD player. I had little understanding of how critical a day it was, how much the odds were stacked against me or the fear my parents must have been feeling. What I do remember, though, was being in a room filled with love and unwavering support. Each year, on Aug. 24 — what I consider to be my “cancerversary” — I wake up and have a good cry, call my parents, hug my kids and do something that makes me happy for the rest of the day. (I have taken every Aug. 24 off from work and will continue to do so forever.) There have been years in which certain things trigger memories earlier in the month or for a longer period of time, but for the most part my (subconscious, I think) reaction to Aug. 24 has been pretty steady, even predictable. This year, I decided to preempt things and give myself something different to focus on. Having seen and felt the collective power of community during my years of treatment, and wanting to do something meaningful to recognize my 15th transplant anniversary, I set up this page with hopes that 1,000 people would give $15 each to the Samfund to help young adult survivors who are still struggling. For the first 18 days of August, my brain was completely focused on that, and each day has been filled with thank you calls and emails to the 180-plus people who have donated. And then this morning happened. I was in the car, listening to the radio, when a song by Sarah McLachlan came on. I’ve heard her music so many times over the years, but for some reason, this morning it hit me like a truck and suddenly I couldn’t stop crying. This year, hearing her voice brought me right back to my hospital room and the grief, the memories and the survivor’s guilt, were completely and utterly overwhelming. I cried on the train all the way to Boston. I sat on a bench in South Station by myself and called two very dear friends who are also cancer survivors (one of whom I went through treatment with at MSK). Both of them understood, and neither one tried to offer up an explanation or told me to “focus on the positive.” They just let me cry, which was exactly what I needed. The word “cancerversary” means different things to different people. Even the actual date — whether it’s the day of diagnosis, or when someone is told they have no evidence of disease, or a surgery date, or any other meaningful day— varies from person to person. It’s not surprising, then, that the emotions that a cancerversary conjure up vary by person. Yet most of us feel like we’re supposed to do something or feel a certain way. We’re supposed to celebrate. We’re supposed to feel grateful. And of course we do… but we also feel survivor’s guilt. We have flashbacks. We cry. We feel scared. Kate S: I celebrate my "cancerversary" on Sept. 1, because that was the last day of treatment I had. For me, it's a good day, and I celebrate every year, big or small, because it's very meaningful to me! For some reason, my date of diagnosis is the hard day for me- nothing totally bad, but it brings back those bad memories of being in the hospital. Dena S: I celebrate the day I was diagnosed with AML and I acknowledge the date of my last hospital discharge. My diagnosis day is my cancerversary, and has included thungs such as extravagant vacations to spending time with my family. It is always emotional for me as it brings back all the memories and feelings from that time. I'm eight years in remission this past June. Shauna B: I hated June and June 27 for a long time. It is the month and day I was diagnosed and started treatment. Twelve years later, I just like to reflect on where I've come and how I've grown. I won't celebrate something I never wanted, but have been known to have a sneaky "f-cancer" drink. 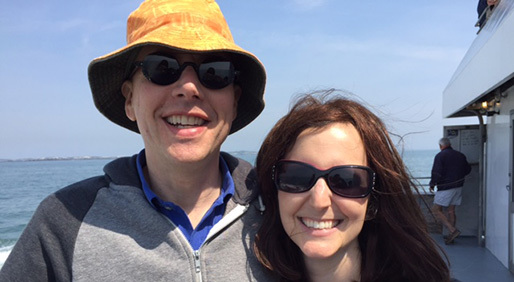 Suzanne B: I hit 13 years since my Hodgkin's diagnosis on July 8. I usually make a post about it on Facebook and re-post some of my cancer treatment photos to remind myself and others what I've been through. This year I didn't do or say anything. I was on vacation with my family, including my 2-year-old twins we struggled to have thanks to cancer treatment, and I just want to enjoy my life now. I honor what has happened to me by working in the cancer field daily and trying to raise money to figure this all out and stop it. It's a part of me, but I am fortunate my life has moved on. What I’ve learned over the years is that all of this is okay. The feelings associated with cancerversaries are complicated, widely variable and sometimes hard to process. All of them are valid. And all of them can change by the year, month, or even the day. As caregivers, friends and fellow survivors, we need to leave room for a range of emotions and validate however someone chooses to acknowledge his or her cancerversary, whether it’s wanting to celebrate, needing to cry or choosing to ignore it altogether. There’s no need to offer platitudes or try to find explanations for emotions that can’t easily be explained. Friends don’t need to have the right words. They just need to be present, and offer up a hug or a shoulder to cry on. A glass of wine usually doesn’t hurt, either.